Book of Mormon prophets, in addition to quoting scripture from the brass plates, quoted other Nephite prophets who had gone before them. 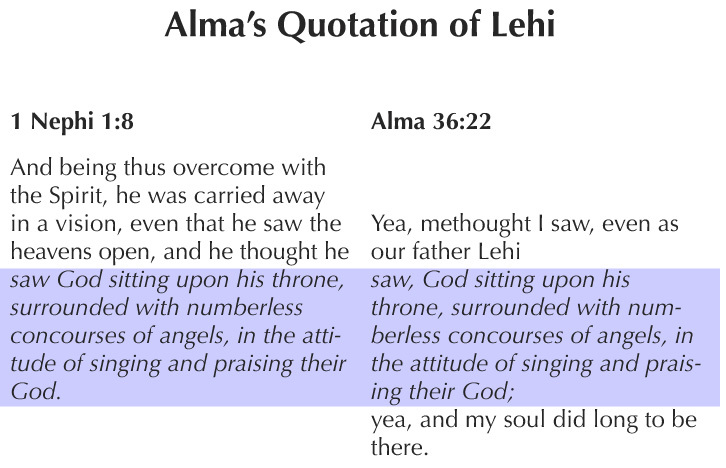 For example, Alma 36:22 quotes Lehi's words found in 1 Nephi 1:8. Because Alma was the keeper of the small plates, he would have had access to Lehi's words. Alma's verbatim quoting of these twenty-one words has interesting implications. These two passages are separated from each other by several hundred pages of text. Because Joseph Smith dictated the Book of Mormon without notes, he would, if he recognized the quotation at all, not likely have been able to remember the original version word for word except by divine inspiration.